Jeffco Public Schools is the second largest school district in Colorado. Many families depend on the school services that Jeffco has to offer, yet when it comes down to the logicality of late starts, the Jeffco officials offer up nothing short of excuses. Colorado isn’t known for palm trees and 365 days of sun and fun. Many Coloradans know their home state to have cold, snowy winters and this weekend, on January 21, the Jeffco area received about 5 inches of snow, yet a delayed start was nowhere to be seen. The 5 inches of snow this past weekend created icy roads that Jeffco refused to acknowledge, though it put some teachers and students at risk; especially the schools in the mountains that are still apart of the Jeffco district. These schools have a more dangerous and icy terrain to cover, yet they are forced to remain open. 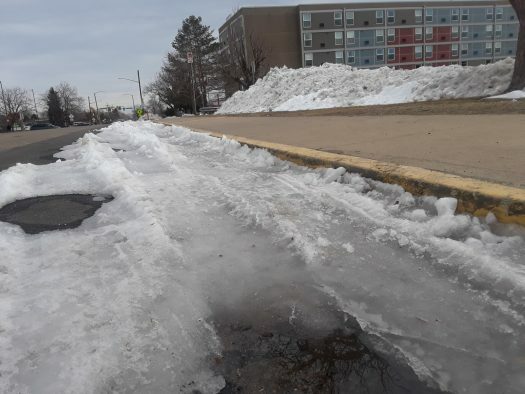 The Jefferson area always had the option of delaying school long enough so that the roads could melt before requiring student and staff to come in. But no. Jeffco believes this course of action is unjustifiable. According to Jeffco officials, parents are able to call in their students if they find it unsafe to travel, but if officials have to say this, if parents have to call in their children because it’s so unsafe, then why are we having school start so early in the first place? Why should parents, students, and teachers all have to risk their lives on a day most people won’t show up to in the first place? The next day on January 22, half of the Argos newspaper staff didn’t show up because the ice and snow prevented students from being able to get to school, either on time or at all. Even one of our teachers, Danielle Muller, was late because of the snow. “I have a four-year-old daughter, so dropping her off at preschool in the morning and getting here on time was really difficult on Monday because of the snow on Sunday,” said Muller. School board officials claim that when they consider delay starts and school closures, “the safety of students and staff is the number one consideration”. But they clearly were lying when senior Braden Markle got into an accident Monday morning. Luckily, no one was seriously injured (no thanks to Jeffco), but Markle agrees that if school had been delayed by two hours, it would have given the roads time to warm up so that students could get to school safely. It’s not just students that Jeffco is jeopardizing with their “policies”. It’s also the parents of these families, like Muller, who are rushing around in the snow to ensure that they get to work on time, too. “My mom, who works in the Brighton school district, was late two hours and they’re just East of us and got hit a little bit harder, but we should have still been at least delayed or have a later start,” said Markle. Jeffco says it rarely opens because it’s a part of “our” history and culture, but is one person’s life really worth the history? If you could ask Christopher Columbus that question, I’m sure he’d tell you. Jeffco is the only district in the Denver Metro area that doesn’t fully believe in late starts or school closures on snow days. Yet when we look at the facts, it’s the most logical course of action to take. When junior Jared Polich tried to call into school Monday morning, the school’s voicemail was already filled to the point where he couldn’t call in until after 1 p.m. Many people may think: “What’s the big deal? It’s just snow”. Well, so far that “snow” has put parents behind schedule and nearly cost one student his life. That “snow” built up in roads and driveways, preventing families from going anywhere. Peters states that if Jeffco had done a late start, then she and her family would have been able to find a different way for her to get to school on time. This isn’t to say that Jeffco doesn’t at all care about its students and staff…as long as it’s on campus. It’s once students are off campus that it stops being Jeffco’s problem- though it’s because of them that we are forced to endure the icy terrain. It’s Jeffco’s responsibility to look out for and protect those who attend those schools in their district. If they care enough to explain themselves and create in school protection, then they should also care that people are inconvenienced by Jeffco’s so-called “reasons”. “They [students] probably feel betrayed by the school system because they expect to be able to have time to be able to get to school on time and be able to learn and to find out that school just goes on without them and they don’t give them enough time to be able to get to school. It just doesn’t work,” said Peters. As long as Jeffco does part of their job, everything will be just fine- except that part of their job does include ensuring a student’s safety, which is the exact thing they’re not effectively doing. “I think they have their heart in the right place and making sure people get their education, but I do think it’s kind of important to have safety first,” said Farrow. This is a situation that’s bigger than any one person. Late starts and school closures on days that require it is a decision that ultimately falls to those who hold that power. However, this isn’t to say that the community of Jeffco doesn’t have a say. If enough students, parents, and staff voiced their opinion, Jeffco officials would have to change their point of views on snow days or at the very least, look into the issue of a rigid and stagnant policy.